This past weekend, we prepared some of our favorite holiday hors d'oeuvres for one of our Boston fashion blogger friends, Heidi A. Dooley (Dooley Noted Style). We were excited to play elves and drop off the nibbles for the hostess with the mostest’s spirited soiree. She covered every festive detail from the wintery white floral arrangements to the carolers greeting guests outside. Of the five appetizers we selected, Tortilla Española was a must. Classic Tortilla Española is a staple in every nook of Spain and is most commonly served as a tapa. Similar to an omelette, it’s a wonderful combination of fried potatoes, onions, lots of olive oil, and eggs cooked together. The traditional version is created stovetop, but in the interest of time and scale, we sped up the process by finishing in the oven. We cut the baked dish into cute cubes and sprinkled on top a confetti of bright red roasted red peppers for a bust of added flavor and flare. Pour 1/2 cup of EVOO into 2 large cast-iron skillets over medium-high heat. Add half the potatoes and onion to each skillet, season with salt and pepper and cook over moderate heat, stirring frequently, until the potatoes and onion are tender and golden but not browned, about 15 minutes. If the potatoes get too crispy on the bottom of the skillet, feel free to add more EVOO. Pour into a greased 9 x 11 baking dish. In a large bowl, beat the eggs with salt and pepper. Pour into the baking dish and move the potatoes and onions with a wooden spoon to allow the egg to seep to the bottom. Bake for 25-30 until the eggs are set. Meanwhile, julienne the roasted red peppers and toss with salt and pepper and set aside. When the tortilla is set, remove from the oven and allow to cool for at least 15 minutes before cutting. 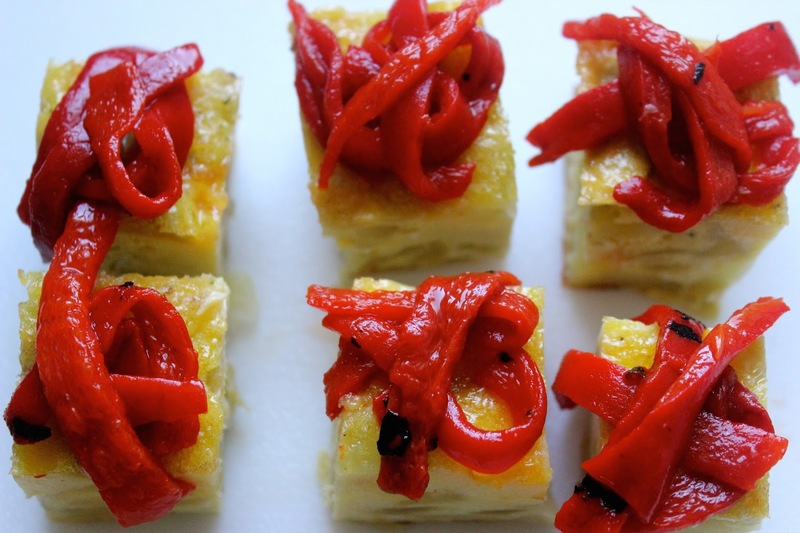 Cut into 2-inch cubes and top each piece with a sprinkle of julienned roasted red peppers. Serve warm, chilled or at room temperature. Makes 38-40 cubes. We love this appetizer because it can be served at any temp, and is also a satisfying vegetarian option for your guests!